Editorial: "It seems to him there are a thousand bars; and behind the bars, no world"
The rest position of the temporomandibular joint (TMJ), the so-called 'centric relation', is discussed controversially. As yet there is no clear definition. According to current understanding, the condyles are bilaterally in the most anterosuperior position over the articular tubercle. The ligaments of the capsule are maximally relaxed. In rest position of the TMJ, the integral of the muscle activity is at the lowest level. The rest position of the joint is a probability and derives from mutual dependencies. Therefore an exact definition is difficult, if not impossible. Finding the rest position, especially in a pathological situation, is difficult. Various procedures are described, but none has proved to be the only true method. The determination of the rest position in a pathological situation can only determine a starting point for reversible therapy by an occlusal splint. This rest position can be defined by palpation of the condyles within the inner ear canal to gain more information of the tissue situation, especially the bilaminar zone, the movement pattern, the symmetry of the right and left sides and the position of the condyles while taking the therapeutic construction bite. The centric bite is easier to take and shows the relation of the mandible in a rest position in healthy joints. In a surgery first (SF) approach, no presurgical orthodontic treatment is carried out, and orthognathic surgery (OGS) is the first step in the correction of skeletal disharmonies. Once the OGS for the correction of skeletal problems is completed, post-surgical orthodontic treatment is required to correct transitional malocclusions with complex dental problems. Recently, in a move away from the use of fixed appliances in post-surgical orthodontic treatment in SF, a new option has been provided to support those patients who desire post-surgical orthodontic treatment with aesthetic and comfortable clear aligners. In this case report, a 24-year-old man with skeletal Class III malocclusion successfully underwent a SF approach followed by short-term fixed appliances, and aligner treatment for detailing and finishing. Elkholy, Fayez / Lapatki, Bernd G.
Objectives: For experimental evaluation of sequential aligner systems, the conventional sequence of aligner thickness (0.5 to 0.8 mm) and a novel sequence using thinner 0.4- and 0.3-mm films were investigated biomechanically in four mechanical in-vitro studies. Materials and methods: The first two studies focused on determining mechanical loads exerted during labio-palatal translation of a maxillary central incisor and derotation of a mandibular canine when using aligners with conventional thicknesses of 0.5 to 0.75 mm. The third and fourth studies examined the mechanical load during different movements of a maxillary central incisor by use of 0.3- and 0.4-mm novel, thinner aligners. All experiments were performed on specifically designed test setups equipped with acrylic casts from which the corresponding measurement tooth was separated and mounted on a three-dimensional (3D) movement unit via a 3D force-moment (F/M) sensor. Results: Even for small movements of < 0.5 mm and < 10 degrees, quite high F/M values, up to 8.4 N and 89.2 Nmm, respectively, were recorded for the 0.5-mm aligner. 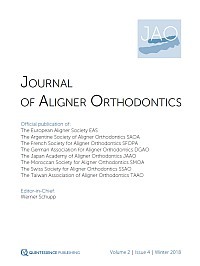 Use of aligners thermoformed from novel 0.4-mm film resulted in mean reduction in force and moment of 35% and 45%, respectively, for translation and rotation of the maxillary right central incisor (tooth 11). Aligners fabricated from 0.3-mm film showed insufficient form stability during repeated seating and removal from the test cast, and should therefore also be unsuitable for clinical application. Conclusions: When using the thinnest 0.5-mm film, the risk of overloading the periodontal structures is quite high. Based on these in-vitro experiments, a novel aligner thickness sequence is recommended using 0.4-, 0.5- and 0.75-mm aligners. This sequence substantially reduces the F/M values exerted by the first and thinnest aligner and ensures relatively constant load increases for each individual setup step. The latest version of the Biotech Dental Smilers planification software allows the linking of information from STL files provided by optical oral scans (or digital scanning, following traditional impressions) and information from DICOM files provided by cone beam computed tomography (CBCT). These three-dimensional (3D) elements can also be coupled with two-dimensional (2D) photographs of the patient in order to add more options. The new radicular and bone segmentation option obtained thanks to information from DICOM files heralds a new era of orthodontics. From now on, multi-layer 3D information can be accessed, which opens up a new field of possibilities for bodily translation movement and torque control. Moreover, tooth root axes and occlusal plane evaluations that were a common source of error with aligners and digital planning are more reliable. 2D mock-ups with photomorphing can be presented to patients, and global multidisciplinary 3D-assisted treatment plans on a single common platform will help practitioners in their everyday practice, with less chairside work and more visibility. Access to this information will provide better simulation and predictability of tooth movement, for increased accuracy and improved results. Conflict of interest statement: Dr Arash Zarrinpour is an inventor and international speaker for Biotech Dental Smilers. In recent years, the Invisalign system has gained the attention of adult patients motivated by aesthetic considerations. This system is now commonly used, especially in periodontal patients. In this case report, a periodontal patient with Class I malocclusion requiring mandibular incisor extraction was successfully treated using the Invisalign clear aligners system.